The Degen DE15 is a portable radio covering AM, shortwave and FM. AM coverage is from 522-1710 kHz and shortwave coverage is 2300 to 23000 kHz. FM is 64-108 MHz. The radio features 225 memories (100 for shortwave, 100 for FM and 25 for the AM band). Tuning is via up-down buttons and scanning. There is also a useful ATS (Auto Tuning Station) function that tunes available signals and stores them in memory. 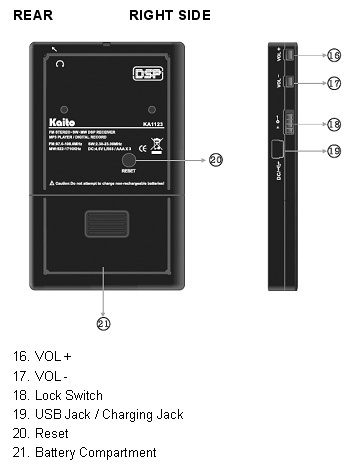 The DE15 has a built-in clock settable to 12 or 24 hour format and there is a sleep function (5-90 minutes). The back-lit LCD permits nighttime operation. 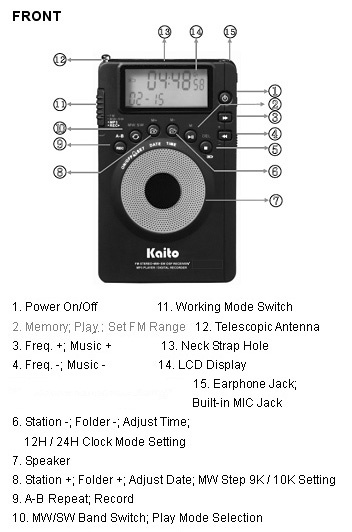 Other features include: headphone jack, 9/10 KHz MW step, battery level indicator, and built-in battery charger. Size: 2.7 x 4 x 0.6 inches (69x110x13mm). The DE15 system comes with: AC adapter, three Ni-MH rechargeable AAA cells, protective carry pouch and stereo ear buds. One year limited mfg. warranty. Please note that this radio may come to your under the Kaito or the Degen label.